Alanna Bock-Butler has been EnSys Energy Senior Modeler/Analyst and Systems Manager since January 2005. With a B.S. Computer Science Major and over 25 years’ broad experience, Ms. Bock-Butler has brought her considerable computer systems experience to enhancing both the EnSys Energy WORLD Model and its associated databases. 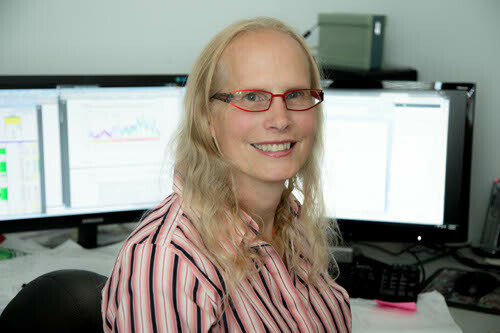 She has deep knowledge of energy data sources and has led complex data analyses throughout her years with EnSys. She has also contributed to the upstream oil production management software products of affiliate EnSys Yocum. Ms. Bock-Butler is at the center of EnSys’ current and recent WORLD modeling projects for the OPEC Secretariat, US Departments of Energy and State, American Petroleum Institute, IMO 2020 Subscription Service clients, among others. Just to name a few projects, in EnSys’ DOE and DOS Keystone XL assignments, she implemented an updated version of WORLD with enhanced detail on U.S. refining groups and crude oil pipeline logistics then later added crude oil export capability in a major 2014 study for the American Petroleum Institute. For the DOE OSPR, Ms. Bock-Butler substantially re-worked and updated the specialist US/disruption-oriented version of WORLD. In EnSys’ work with the OPEC Secretariat in each annual World Oil Outlook cycle, as in other projects, Ms. Bock-Butler manages Model links to key statistical sources. She has also developed advanced capabilities for WORLD Model users to execute multiple cases so that alternative scenarios can be efficiently analyzed. Ms. Bock-Butlers’ everyday activities include organizing, executing and reporting WORLD cases. In addition, Ms. Bock-Butler designed the system which enables EnSys and clients to analyze essentially any refinery worldwide. Prior related work included major updates to and expansion of the EnSys Bloomberg refining netbacks. These systems use WORLD in single refinery form covering multiple crude/refinery combinations across major world refining locations. As a Senior Analyst, Ms. Bock-Butler has carried out extensive research in support of EnSys’ expert witness work in relation to various cases such as MDL litigation in New York, New Hampshire and New Jersey concerning the use and impacts of MTBE in US gasoline. This and other aspects of her work entail extensive analyses of U.S. and global oil statistics. A recent key role entailed leading EnSys’ effort to analyze massive amounts of proprietary data relating to Cushing crude oil flows for the CFTC and the development of a unique Cushing flow model. Prior to joining EnSys, Ms. Bock-Butler worked with a wide range of systems companies and gained international experience in China.